Cooling from impinging water jets in runout table (ROT) processing depends on the fluid flow and depth of water accumulated in the water pool that forms on the surface of the moving steel strip. This effect is investigated with a three-dimensional (3-D) computational model of fluid flow, pressure, and free surface motion for realistic banks of nozzles within the flow rate region of the ROT process (2400 to 9200 L/min m2). The volume of fluid (VOF) method with the high-resolution interface capturing (HRIC) scheme was implemented to handle the free surface flow of the water jet, and the k-ε model was used for turbulence. The governing equations are discretized by a second-order accurate scheme and solved with the computational fluid dynamics (CFD) code Fluent. The model was validated with experimental measurements of free-surface shape and hydraulic jump position for a single water jet impinging onto a moving surface that included turbulent flow and multiphase regions of mixed bubbles and water. For banks of water jets impinging onto the surface of the moving strip in a realistic ROT, the free surface shape, velocity, and pressure distributions have been calculated for various flow rates and surface widths. A deeper water pool is expected on the moving surface with increasing water flow rate and with increasing width. In addition, as the water pool height increases, the pressure variations on the moving surface below the water jets decrease. A simple relation to predict the water pool height from the water flow rate per unit area and strip width has been derived. The predictions agree well with both the 3-D calculations and measurements from water model experiments. Manuscript submitted January 16, 2008. 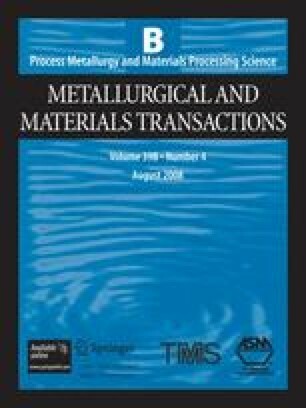 The authors express their sincere gratitude to Professor Gradeck for his help in providing the single water jet experimental data for the verification.